Because of my bathroom remodel gone wrong in 1999, I am a big advocate for do it right the first time. When I purchased my home the entire place was in need of major repair, this was a major fixer. It needed 35 foundation piers, a French drain system, new roof, bathrooms, kitchen, paint, hardwood floor refinishing and that does not touch the landscaping, fencing and lighting. At the time of the purchase I was completely overwhelmed with a 2 ½ year old and an 8 month old. I picked out tiles and fixtures based upon cost and the desire to just have a clean space. Of course I immediately hated the room when it was complete and despised when people had to use the bathroom, frankly I was embarrassed. I am suppose to have great taste, what happened?! Last year my husband and I decided to gut the space and start over. We have a very different aesthetic, and to add to the complexity, I wanted to avoid anything Made in China. We designed it together and agreed on everything pictured. 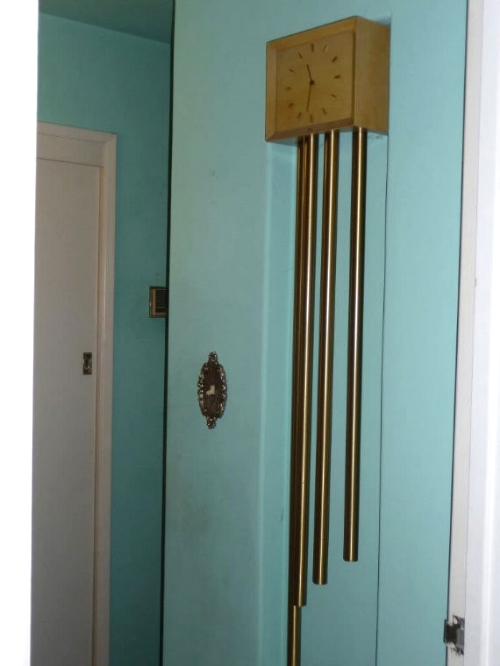 Our home was built in 1951 and I wanted a modern, simple look that would blend with the home. 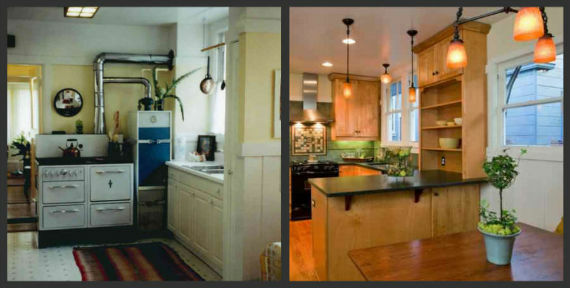 Sneak Peek of 2013 Rockridge Kitchen Tour! This past January, I dropped my daughter, Nia off at her friend's home for a sleepover and was totally inspired by this reinvented mid-century modernist kitchen. 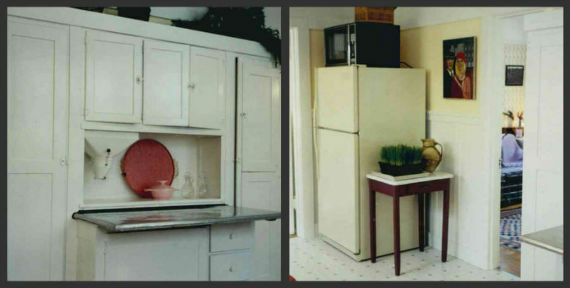 The entire project was inspired by the 1956 Kelvinator side-x-side 'Foodarama' (literally it's name) Fridge. 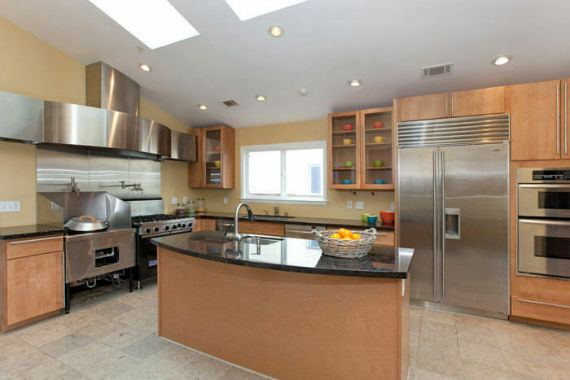 Later I came to find out that this is one of the kitchens that will be featured in the 2013 Rockridge Kitchen Tour. Owners Diana and Craig used Architect was Struther Dias in San leandro: www.strutherdias.com for the project. Photo from Houzz .com of wallpaper behind open kitchen cabinets. Wallpaper seems to have made a comeback. 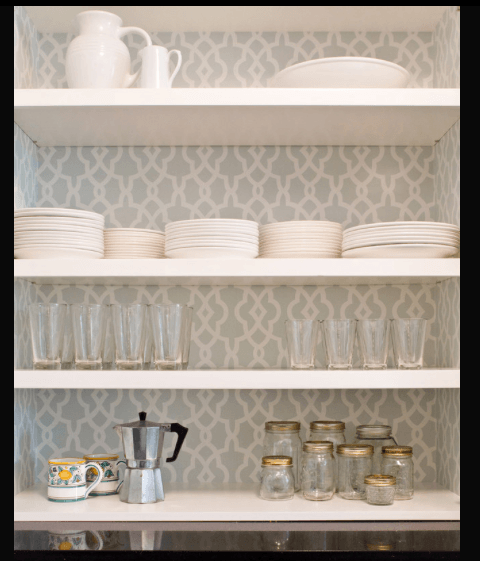 It is great as an accent wall or behind a bookshelf and can instantly add visual interest with texture, patterns and color. You can get reproductions of vintage prints from companies like Bradbury & Bradbury Wallpapers or unique original patterns like the ones put out by Grow House Grow. Anthropologie has an artful selection of wallpaper to browse. 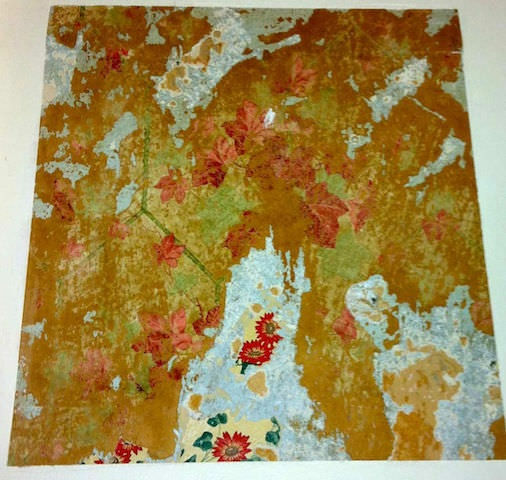 This year I sold several homes that had vintage wallpaper and I encouraged the buyers to preserve a wall of it whenever possible. 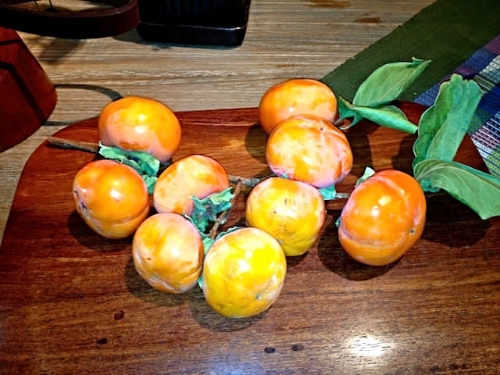 Yasai Produce Market on College Ave at 63rd across from Cole Coffee has wonderful affordable produce for sale such as gourds and persimmons that can be styled into your home instead of fresh flowers. I recently sold a home to an architect and a photographer. 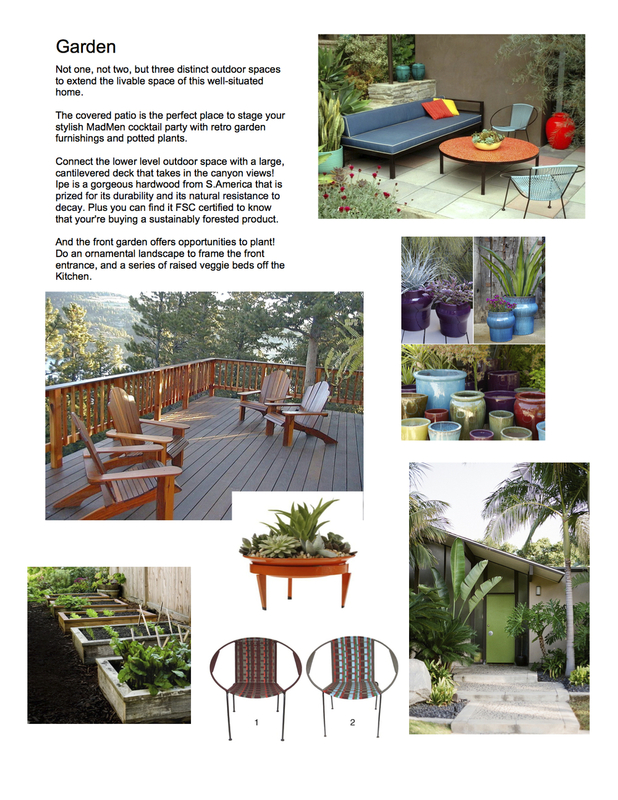 They have killer style and plan on transforming their "new" 1918 Haddon Hill, (Oakland) home into a showpiece. 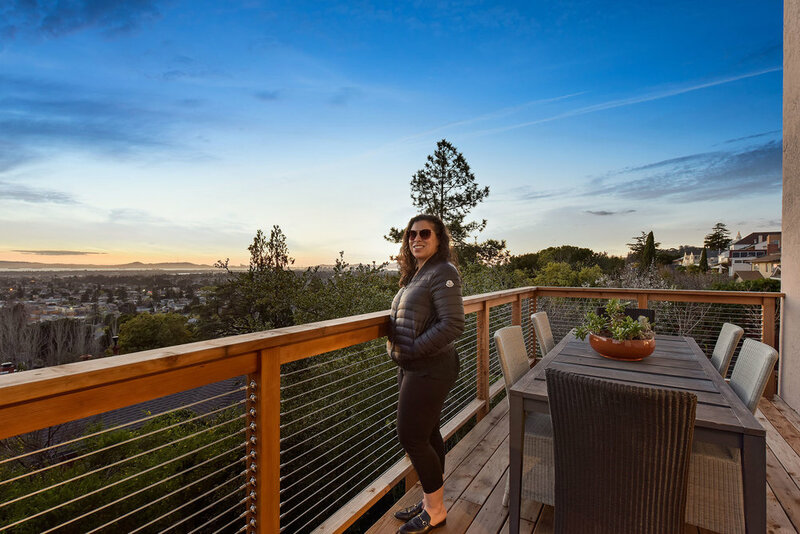 They were drawn to this home for the location - blocks to Lake Merritt, the great layout - the house has an open living room and dining room plus a huge eat-in kitchen that opens up to the backyard, and the natural light. 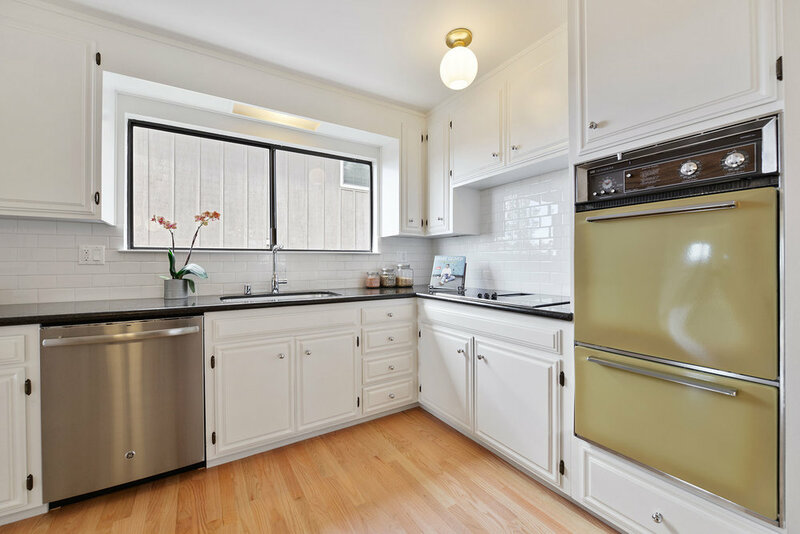 They were not fond of the cheap Home D---t lights, the honey colored mass-produced kitchen cabinets and the scalloped edge trim that was added to the original built-ins - all things that can be fixed. The one thing that I really encouraged them to do is keep the original tiles on the fireplace hearth. Even if they choose to give this home a modern edge the textural tiles can compliment the house. I love mixing old with new and the warmth of these tiles, (see below) will anchor this room. I can't wait to see what they do! Pictured below is another fireplace from a 1923 Haddon Hill home on Wesley Ave. I hope the new owner keeps this beauty. I absolutely love what Joyce did during her kitchen remodel. After renovating the kitchen and restoring the walls, she decided to create a "picture" of the history of her 1910 home. In the photo below you can see various wallpapers and plaster layered under the paint. 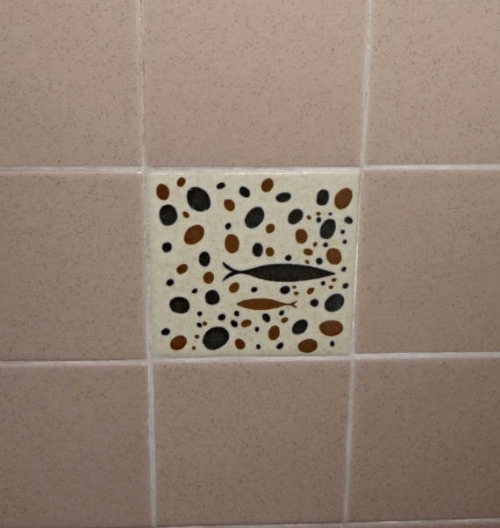 A nice rectangle was evenly measured to create a custom work of art. Genius! Every buyer has a wish list as they venture out and start their house hunt. 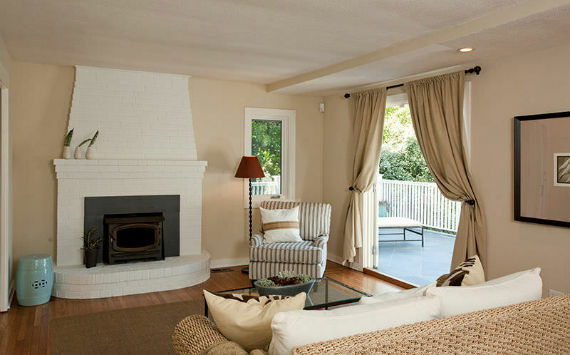 My Crocker Highland buyers wanted a home in original condition. They wanted to embrace the vintage details of a 1920's or 1930's property and enhance it to blend with their modern edge. All of the original gum wood was preserved. The hardwood floors were refinished with a water based matte finish to open up the space. The wall paper was removed and the plastered walls were hand restored. 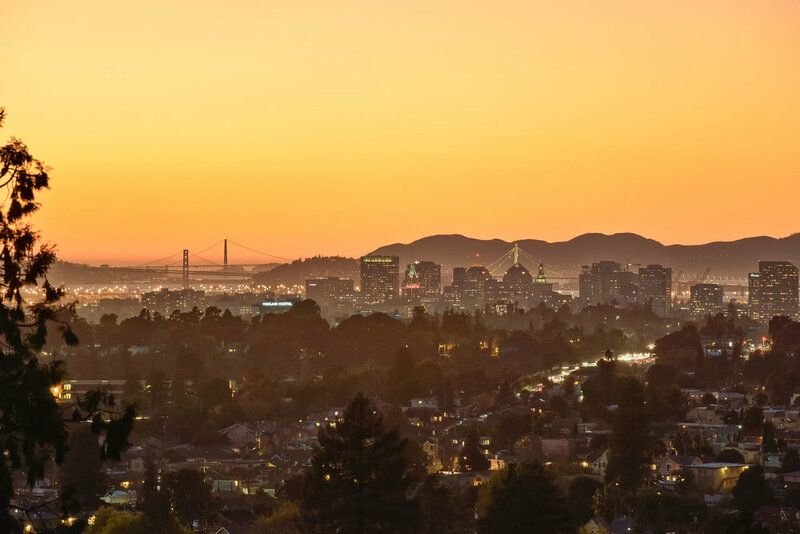 Since the real estate market slow down, most of my home-buying clients look for properties in the best neighborhoods that they can afford having wonderful lay-outs or flow with potential for improvement. They are willing to live in an outdated home that is structurally sound. 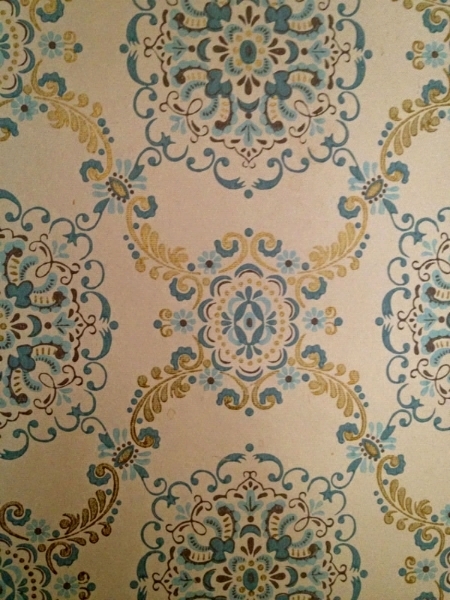 Old floral wallpaper or brown 1978 laminate kitchen cabinets? Bring it on! I'd say the number one question asked when house hunting: is there hardwood under that carpet? ( if there is wall to wall carpeting) I often look for hardwood in the closets or any small seam in the carpet to take a peek. When Amy and Drew purchased their home last Fall, we knew there was hardwood in all of the rooms except the hallway was an unknown. The day escrow closed, I met them at their new home with my go-to hardwood floor guy, Danny. We immediately pulled up the carpet to reveal oak floors. Refinishing hardwood floors before your move-in day is ideal, as you will not have to re-arrange and move furniture later for access. Silky smooth, clean floors is a great starting place for new beginnings in your space. At Amy and Drew's Crocker Highland's property, Danny sanded a few spots on the floor and rubbed on oil based and water based polyurethanes for comparison. Amy who has a fantastic aesthetic preferred the matte and subdued water base finish that also has lower VOC's. Here in the East Bay where we have older housing stock, original oak and fir floors are prized. If you are considering a floor improvement try to avoid, laminate or engineered flooring if you can. Floors that match the era of your home is ideal. A good hardwood floor person can make repairs on your existing floors including the removal of your old floor furnace and /or a few rotten boards and add new boards that will blend in seamlessly. Montclair is an area of Oakland above Highway 13 between Broadway Terrace and Park Boulevard, with properties built from the 1920's to new construction. 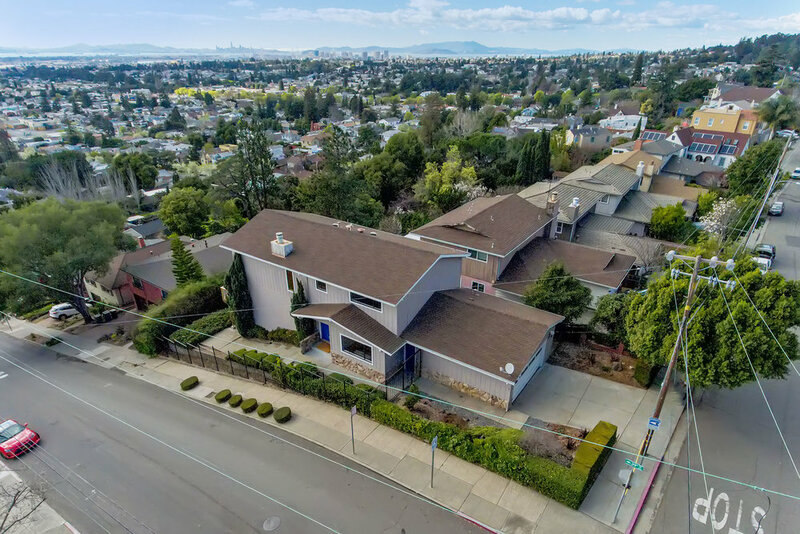 The appeal is the woodsy setting and in many parts of Montclair you will get the feeling that you are away from it all, yet so close to the city vibe. 5687 Florence Terrace is a 3 bathroom, 2+ bedroom home, currently on the market for $698,000. 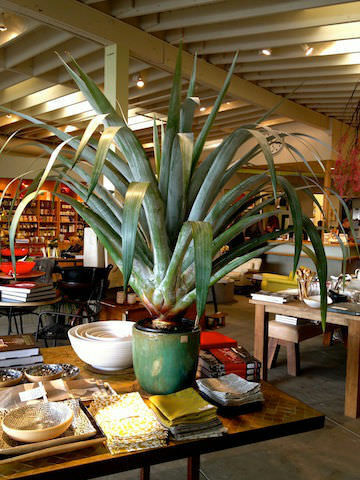 The cool thing is you are only two blocks up from Mountain Boulevard which is a straight shot to Montclair Village, (a retail and restaurant district of this area), yet you feel like you are in a very private, lush nook. Set back from the street, with drought resistant perennials flowers and paver-stone hardscape this house is very striking and handsome. 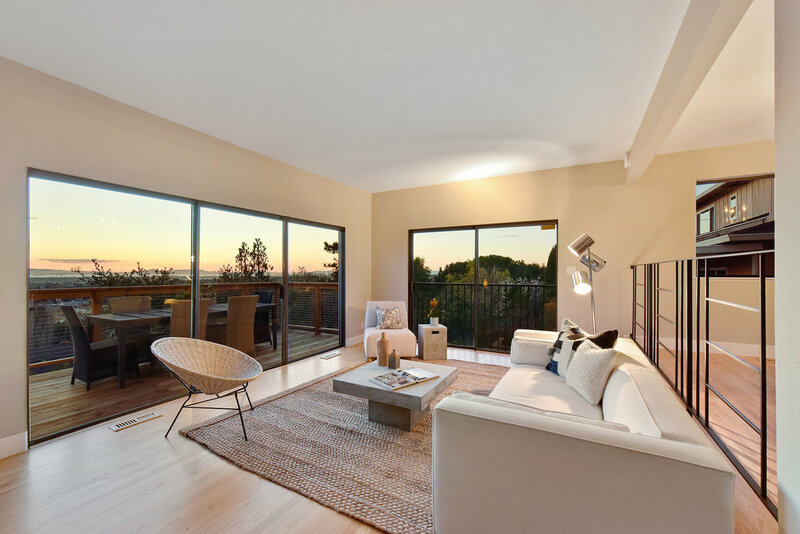 Once inside the three sets of french doors to the grand balcony will capture your heart. The simple and tasteful white decor is minimalist, meets Shabby Chic, meets East Coast beach house. 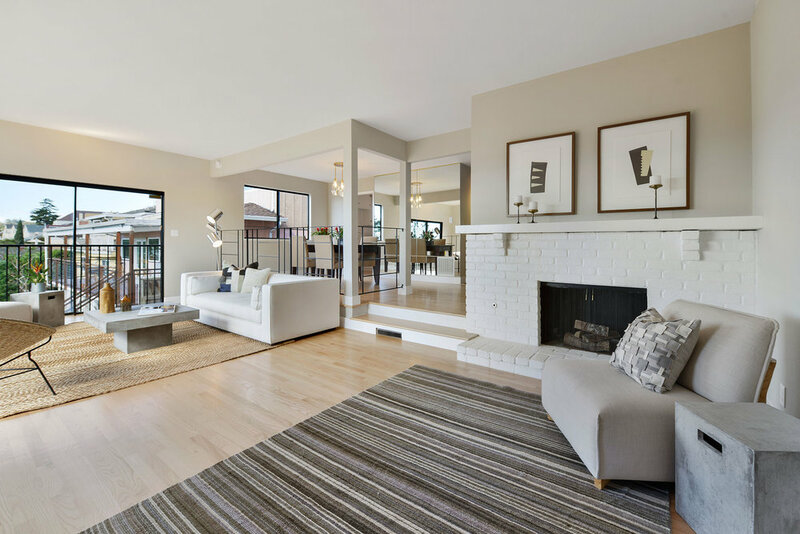 The owners of this house have done tons of upgrades from structural improvements to fantastic cabinetry and this house is truly a move-in and hang your artwork house. This property has been renovated tastefully, yet it retains all of the essence of 1923 the year it was built, making it a must see. 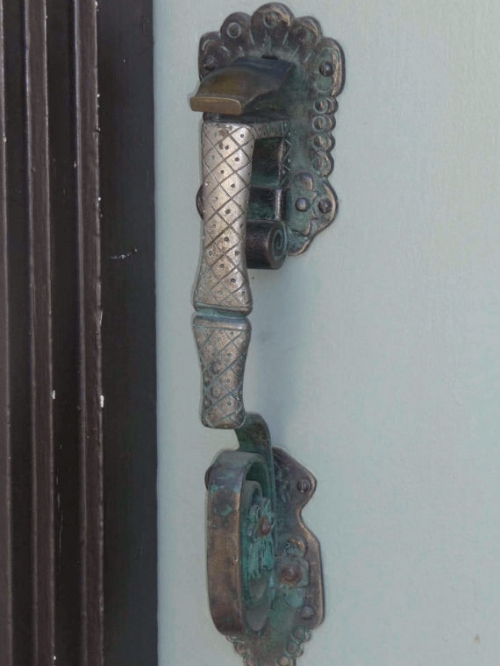 This door knob was on a 1930's home in the Redwood Heights district of Oakland. This particular property sold needing repairs and TLC, I hope that the new owners keep this knob as it is a piece of art. A reader asked me where to buy mid-century furniture in the Oakland - Berkeley area. 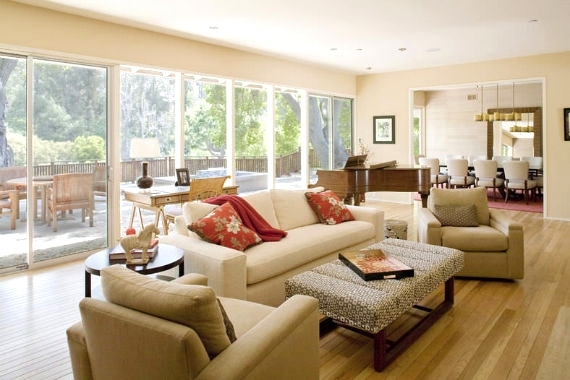 To really enhance your mid-century home what could be better than mid-century furniture. Form Vintage Modern on College Avenue is a small furniture and home furnishings store that features original mid-century pieces mixed with mid-century inspired new pieces. Sofas and large furniture can be special ordered. Form glows with George Nelson’s bubble pendant lamps that are now reproduced by Herman Miller. Coming Soon from Joe and Lindsay at Form is Urban Home! This will be the place for modern, vintage, traditional, and industrial furniture and furnishings. Look for the same eclectic style and greater selection that you've come to expect from the Form Vintage Modern at affordable prices as this will be the place to consign and buy. 1825 Eastshore Avenue in Berkeley. 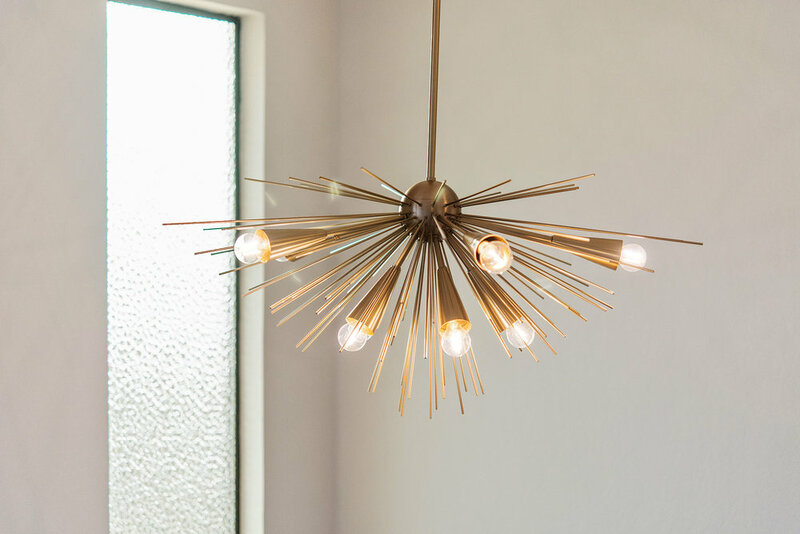 Klassik by Lynne at 1313 67th Avenue in Emeryville on the Oakland border features Danish Modern furniture. This huge warehouse is the place to purchase vintage Danish modern furniture as well as new Danish and Swedish pieces. Lynne has a huge selection to choose from, from credenzas to dining sets and much more. Lynne brings in furniture from Denmark by the container! She visits her homeland often and drives all over the country to hand select and secure impeccable vintage pieces. On one of Lynne's trips to Denmark she met an older man who had hundreds of rolls of vintage fabrics saved from the mid-century. Lynne purchased 315 rolls making it possible for you to reupholster your vintage Danish furniture in vintage fabric! Lynne also sells Kvadrat fabrics , (Kvadrat was established in Denmark in 1968 and now holds a leading position in the European market of design-textiles supplying renowned architects, designers and furniture manufacturers throughout the world.) Kvadrat imports their wool from Ireland and England and spins it, dyes it and then weaves the fabric. Other textile companies weave fabric in cream color and then dye it, but Lynne feels that dying the thread before weaving makes for a better product. Chris Howard is the operations manager at Klassik by Lynne and he does an amazing job of restoring Lynne's vintage finds from her Denmark adventures as well as the furniture that customers bring in. I fell in love with a simple oak and teak credenza that would be perfect for my home office and I was told that it was a Hans J. Wegner piece. I asked Lynne how I could be certain that the piece was authentic. She pulled the Danish credenza away from the wall and showed me a stamp. She then pulled out a book that showed the various seals from furniture producers and the designer behind them. On the credenza in question there was a stamp that said 1955, Made in Denmark and it had a logo-ed stamp with a RY. Sure enough the logo with the RY produced Hans J. Wegner furniture. What great service and expertise! 99% of Klassik by Lynne's inventory is vintage but she does sell new production of Hans J. Wegner, Louis Poulsen and Nanna Ditzel. Lynne says now is the time to purchase vintage Danish furniture as she is worried about the dwindling inventory. Denmark is a small country of about 5 million people and the demand for mid-century Danish furniture is high. Danish modern furniture is highly desired and exported to the US, the Middle-East and Japan. Boy if I knew then what I know now... Being the shopaholic that I am, I have purchased furniture and home accessories with many different motives. The red sofas because I loved the lines and color, the oak mission desk furniture, because it was quality furniture and I was just starting out and didn't have an overall concept of what I wanted my house to be, the maple dining table with the veneer top, to the dozens of vases and art pieces that just called my name... Now I have a house full and wish I had an overall plan before I started. As I looked at my home office space I realized that I need more storage and thought about asking my husband for an armoire for Christmas and then I thought, what would Laura do? 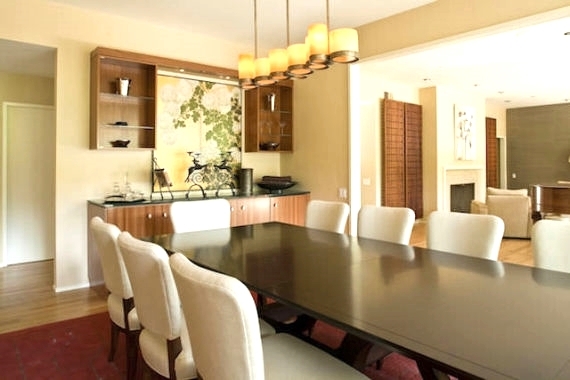 Laura Martin Bovard is an Oakland based Designer who creates spaces that her clients love to live in. I have always steered away from Interior Designers as I thought I couldn't afford one, so I talked to Laura and asked her for some advise and realized that I had it all wrong. Q: How do you advise your clients to start the decorating process? Q: I have always thought I couldn't afford a decorator, what are your thoughts? A: Sometimes I hear that my clients don’t perceive that they can afford to work with a decorator but in fact in the end we can help them save money by coming up with a plan and by shopping smart. We have resources that most people don’t have access to and often get them at dealer pricing which allows us in many cases to re-sell them at below retail pricing. You can think of it this way…the money you save on making purchases through us goes to the design fees which is the time we spend coming up with and implementing a cohesive look that reflects who you are. Q: What is it like to work with a decorator? A: When you work with a decorator it’s like having a coach tell you yes, that size will work or no, that finish won’t flow so you avoid making costly mistakes. Bringing a decorator in before making expensive decisions is very often where clients end of saving the most money. I can’t tell you how many kitchen and bath remodels I’ve seen go awry when people chose materials that simply don’t go together or don’t fit the style of the house. On the other hand a couple of hours with someone who has a good eye for design and experience can help you get through a remodel or a decorating without wasting time and money. Q: Do you help clients with small projects, such as paint color consulting ? A: Yes, for less of a commitment but one that still nets good results we are able to come in for a few hours and help our clients freshen up their space without purchasing new items by styling with a designer’s eye by rearranging furniture, re-hanging art and basically “shopping” your own house to shift the energy. · painting the backs of shelves a dark color to allow the objects and books on the shelves to pop off. · I love to hang a textured or beautiful wall covering on just one wall which provides a focal point and another layer of beauty or just painting one anchor wall can make it feel like a whole new space. Good design is all about creating layers so when we see an opportunity to do so we jump on it. The following pictures show a recently completed job in San Leandro, a fresh, soothing mid-century modern home. 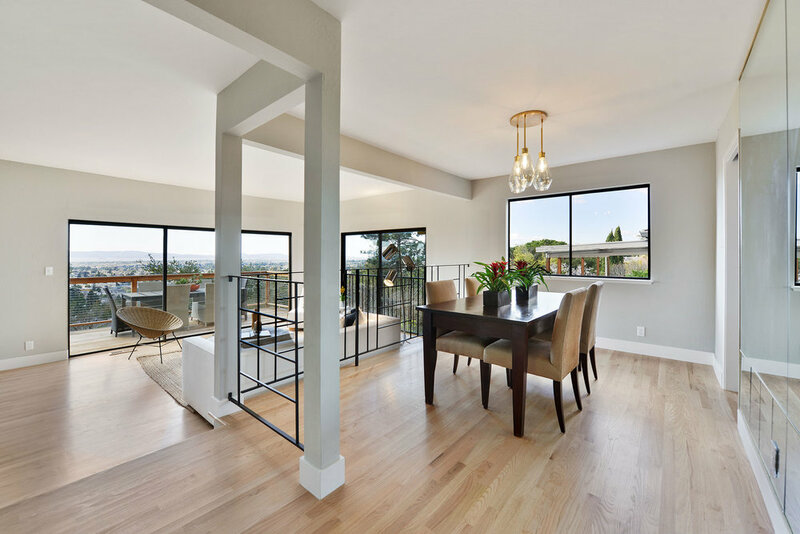 The construction remodel was done by Welte Construction, a local contractor in San Leandro. Laura said they are a super nice and professional firm. Why am I bringing up Julia Child, her movie and life on my real estate and style blog? Because I love her kitchen! Maybe it is because many great meals were prepared here, but also there is something homey about Kitchen-Aid mixers on the counters and a vast variety of pots and pans hanging on a peg-board. Often the kitchens that we drool over in magazines have sparse counters with bowls of lemons. The kitchens are fantastic, but they do not look lived in. I tried to find out when this kitchen was last remodeled, as I believe Julia hosted 3 different television series in this kitchen, but I had no luck. The green shaker style cabinetry is classic and warm, the large farm style table in the middle of the room is perfect for family gatherings or the ideal place to sit and chop. I never would have thought to hang framed artwork on my cabinet doors, but it all works. 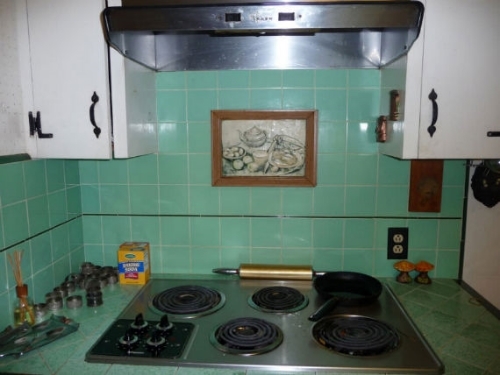 The wall oven is a bit big for the cabinet it holds, (making me believe that oven was a newer addition, but the photos of Julia Child's kitchen by Pedro E. Guerrero from 1962 look quite modern.) 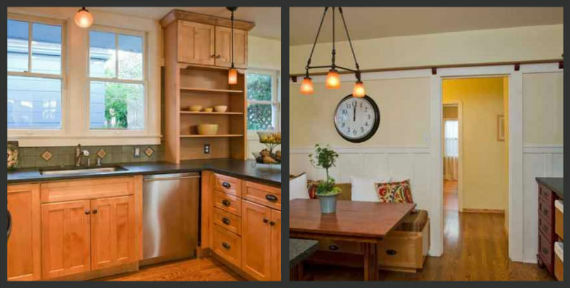 If any of you know more about the Julia and her kitchen remodels leave a comment!